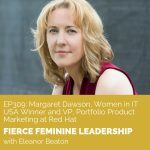 Margaret Dawson is the Vice President of Portfolio Product Marketing at Red Hat. A 20-year veteran in the tech industry, she was recently the 2018 Women in IT USA winner as well as the Business Role Model of the Year for the United States. With a background on traditional communication, Margaret has led teams of all sizes – from startups to Fortune 500 companies such as Microsoft, Amazon, and HP. Margaret joins me today to share the significance of setting strong boundaries and the relevance of “letting your light shine.” She discusses how she established clear boundaries and expectations in high-performing work environments and shares behind-the-scenes stories of how she balanced the demands of her career and home life. She also shares the role that vulnerability, openness, and honesty play in the trajectory of your career as well as the importance of having different types of support in the development of your leadership skills and the kind of leader that you are going to be. Figure out what’s important to you and what you’re passionate about. Let your light shine to everyone. Be willing to try new things and take on new challenges. Forgive yourself – and others. Are you ready to build, leverage, and scale your business to the next level? Ready to maximize your leadership skills and grow your business to 7-figures and beyond? Join our Incubator Program – the 12-month high-octane program that blends leadership strategy, accountability, and business building support to help you propel your business to the next level and increase your earning power. Head over to EleanorBeaton.com to learn more about The Incubator Program and submit your application today! Are you ready to take your leadership and influence to the next level in 2019? Join the Impact & Influence Leadership Lab for Women with Eleanor Beaton – the world’s premier leadership training and implementation program designed specifically for female leaders! This is an 8-week mentoring program for professional, ambitious women in business who are ready to take their leadership skills to the next level and truly step into their power. Visit the Leadership Lab for Women website to see all of the amazing content, tools, and services you will receive by registering today to claim your seat at the table!